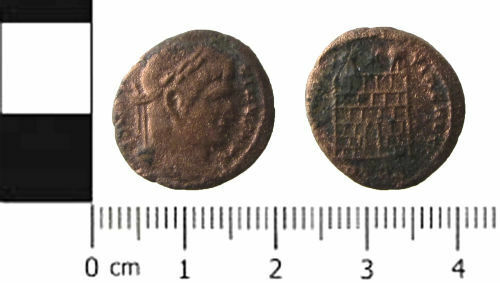 A copper alloy Roman coin: a nummus of Constantine I, dating from AD 324 - 330 (Reece period 16), PROVIDENTIAE AVGG reverse type, depicting a camp gate with two turrets and a star above. The mint is Trier. Probably LRBC number 38. The coin is 18.5mm in diameter and 1.22 mm thick. It weighs 2.12gm. Obverse description: A laureate head of the emperor, facing right. Reverse description: A camp gate with two turrets and a star above.